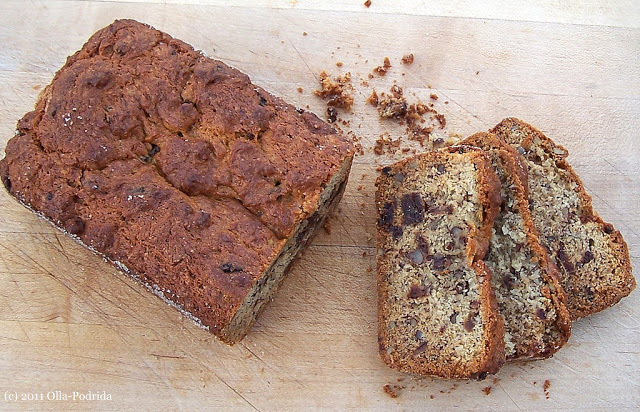 Don’t ask me why (really, I mean it, don’t ask) I think of banana cake at Easter time. 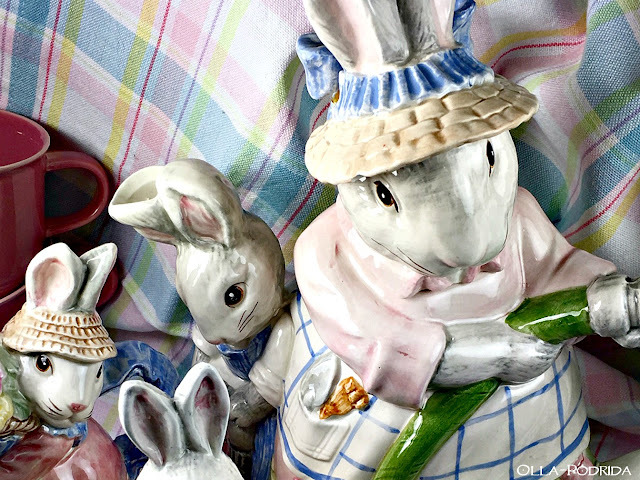 I know, I know, the Easter bunny eats carrots (Well, who knows? He may eat bananas as well. 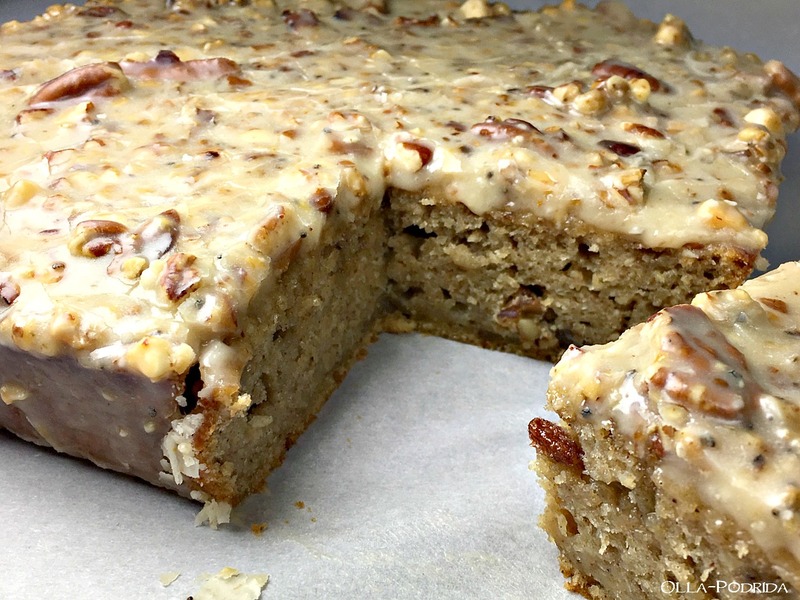 ), and carrot cake seems to be the norm, but today I made a banana cake, and it is sensational! Seriously, I think this kicks carrot cake to the curb (Except for my Secret Ingredient Carrot Cake, of course!). It would work equally well at your Easter brunch or dinner, and the beauty of this cake is that it needs to be made the day ahead of serving. 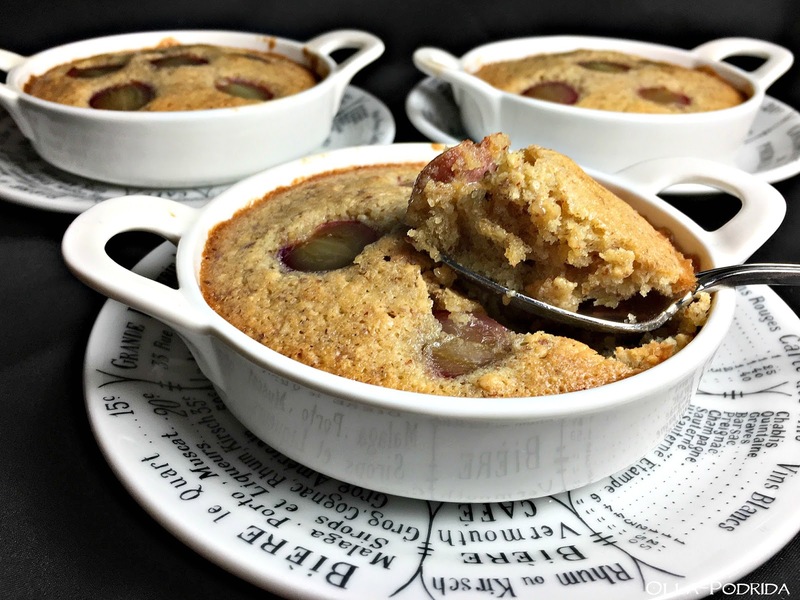 It tastes just fine and is certainly serve-worthy shortly after baking, but the flavors have a chance to meld if left to set at least eight hours. While it needs to be made ahead, it also doesn’t keep well, so if it isn’t completely consumed the following day, put it in the freezer. It will last, frozen, for up to three months. Preheat oven to 350°. Grease and flour (or spray with Baker’s Joy) a 9” x 9” pan. Cream sugar, butter, and bananas until smooth. Beat in rum extract and egg. Blend dry ingredients together in a medium-sized bowl; add to wet mixture alternately with buttermilk. 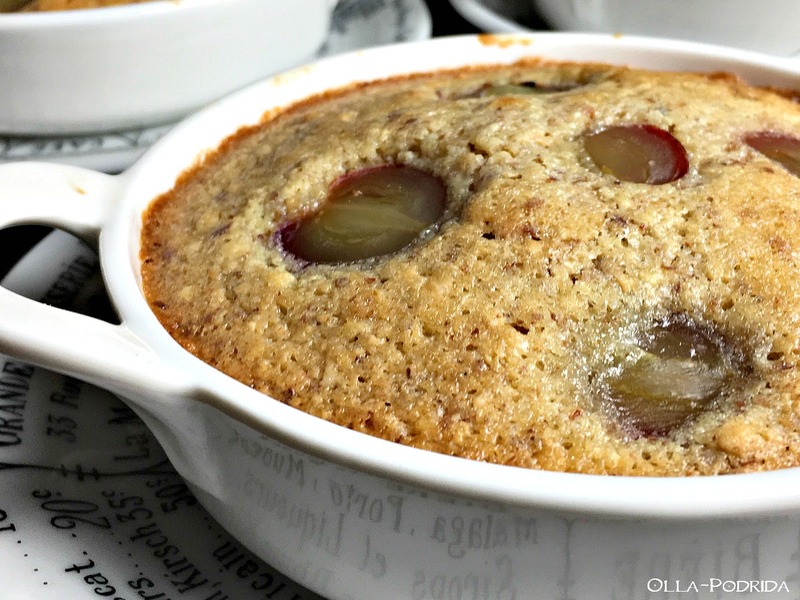 Pour mixture into prepared pan, smoothing top, and bake for 40-50 minutes, or until top is golden brown, cake has pulled away from the sides of the pan, and a toothpick tests clean. Remove from oven and cool completely on a wire rack. Bring butter and sugar to a boil in a medium/large sauce pan. Cook over medium heat, stirring constantly for one minute or until slightly thickened. Allow to cool 10 minutes. Whisk in milk, powdered sugar, and vanilla. 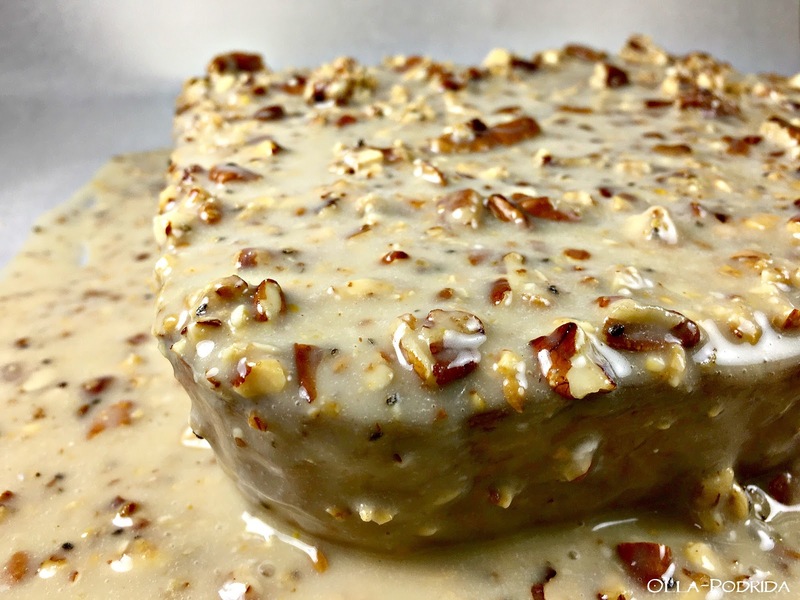 Fold in Clean Snax and pecans, and pour over the top of cooled cake. Allow cake to set, uncovered, at room temperature for eight hours or overnight before serving. 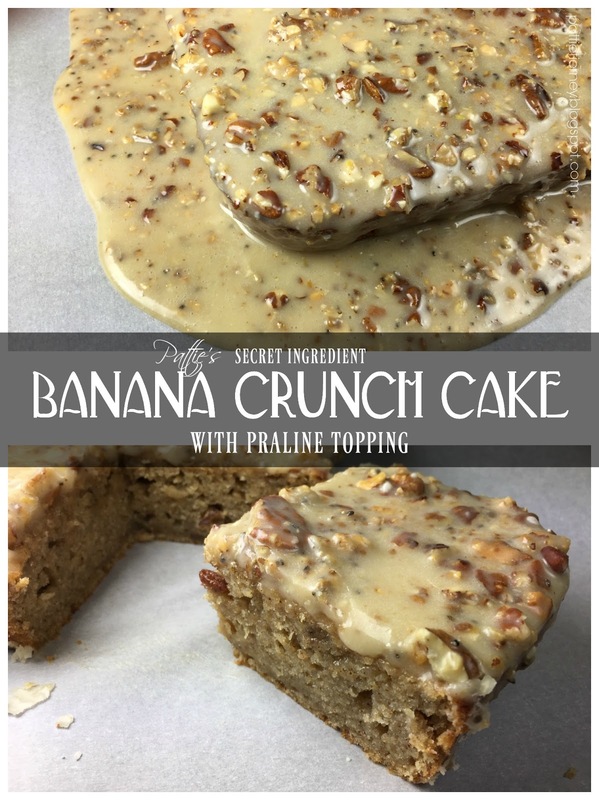 This cake does not keep well, so it if it isn’t consumed the following day, freeze for up to three months. 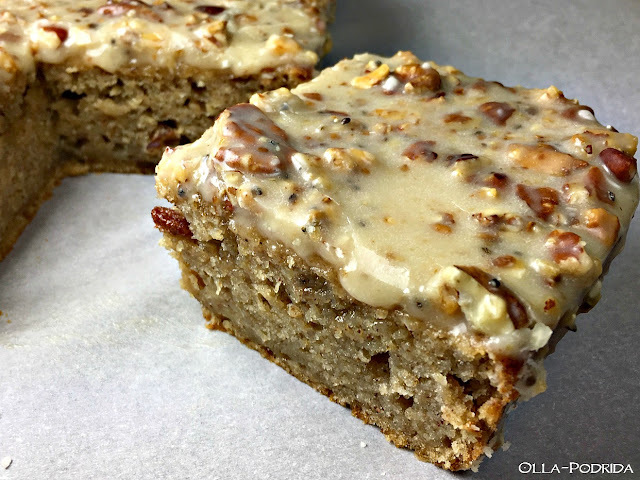 A not-as-sweet banana loaf is my grandmother’s Banana Date Nut Bread, a delicious family tradition. 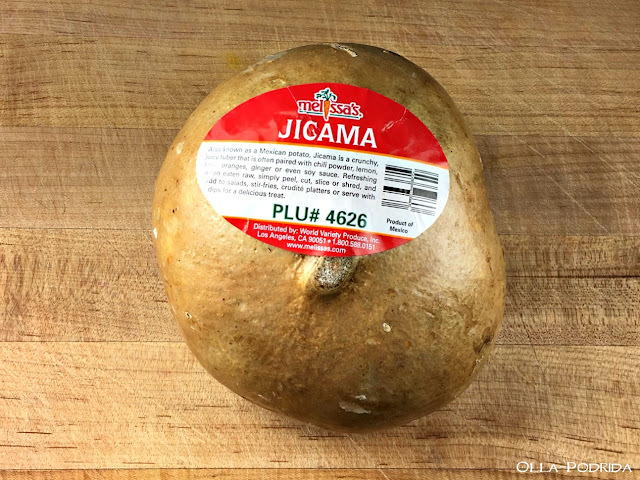 If, like me, you are unfamiliar with jicama, let me educate you. 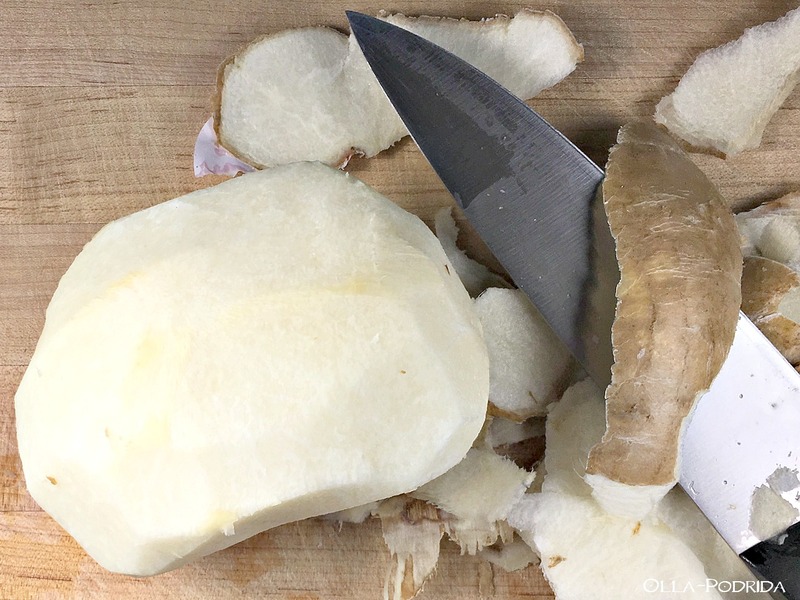 This root vegetable with its yellow and papery skin is creamy white on the inside with a crisp texture similar to that of an apple or raw potato. The flavor is slightly sweet, and the jicama is surprisingly juicy. It can be cooked, but is largely eaten raw, and, unlike apple or potato, will not turn dark if stored after slicing. It is high in dietary fiber, composed of 86-90% water, is low in saturated fat, and a good source of vitamin C. It’s also quite tasty! 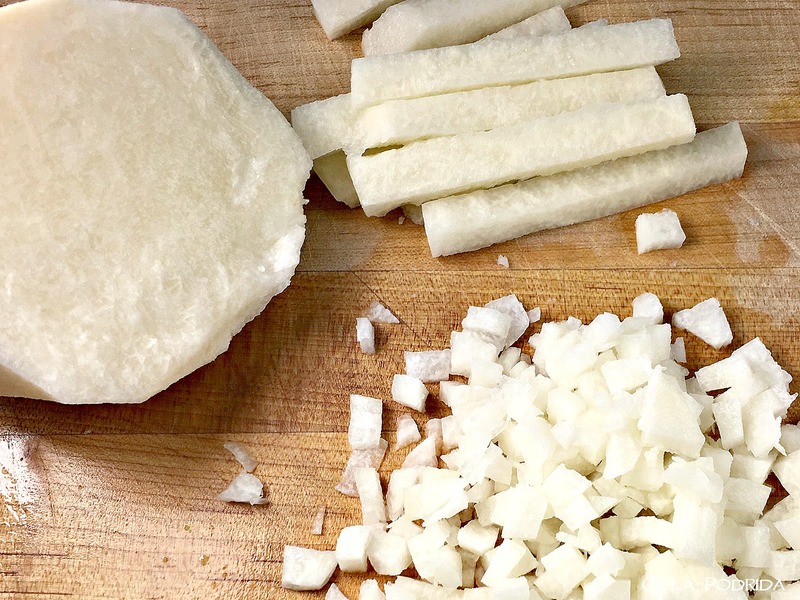 Use a knife when you slice it — a vegetable peeler does not work well at all. 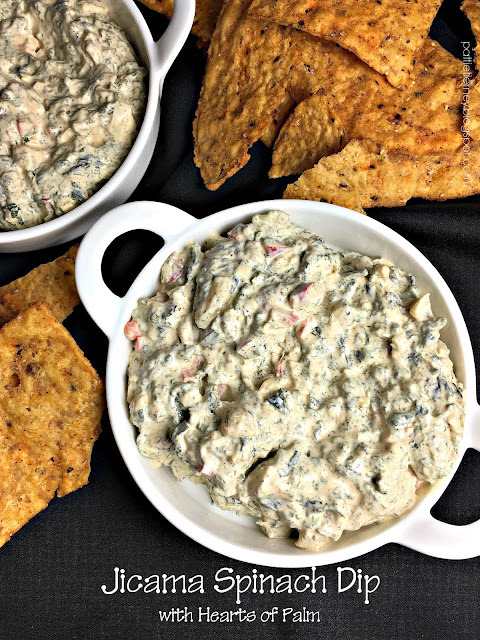 Slice it into cubes to toss in a salad, strips for dipping, or mince for including in this delicious dip/sandwich spread. A word of warning, it makes A LOT (as Jed Clampet used to say “a heapin’ helpin’”), so be mindful of that. If you want to cut this recipe in half, you certainly can, in which case cut back on the soup mix(es) to 1/8 cup (2 Tablespoons). I served mine in these darling 5 oz. ramekins for which I never seem to run out of uses. Mix all ingredients together in a medium mixing bowl. Chill at least 3 hours or overnight. Keeps in the fridge for 2-3 days. 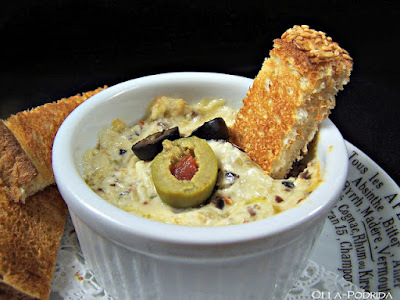 If you like Hearts of Palm like I do but prefer a warm dip, you will love this Baked Hearts of Palm Dip. Spring is here, and that means rain. It also means gloomy, chilly days. When days like this are upon me, I tend to make soup. It just seems to be the right thing to do, and the right thing to eat in order to take the chill off. 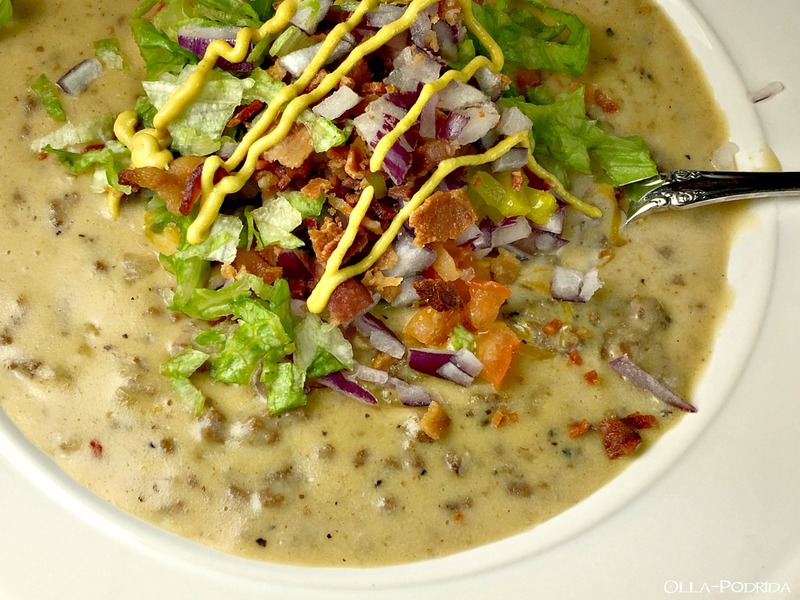 If you’ve read this blog for any length of time, you know that my favorite food is a cheeseburger. 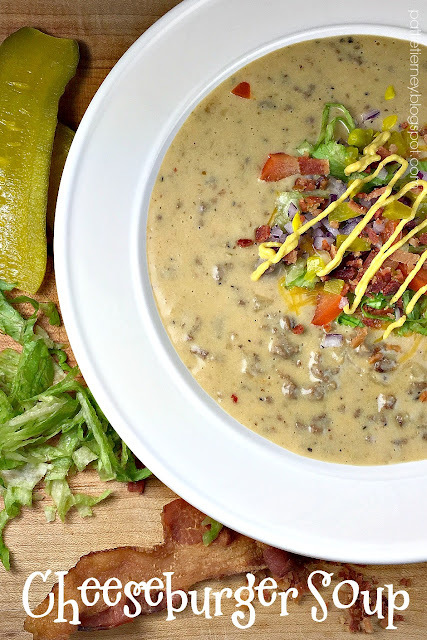 Recently I saw a number of recipes for cheeseburger soup and figured this was right up my alley. One thing I did find puzzling about these recipes is that many of them called for vegetables -- carrots, celery, and potatoes to name a few. How many of you have eaten cheeseburgers topped with carrots, celery, or potatoes? Okay, maybe potatoes in the form of french fries, but still this all seemed weird to me. Then I stumbled across this recipe I knew it was the one. Believe it or not, this actually does taste like a cheeseburger! It’s very easy to make, requires relatively few ingredients, is an absolute winner, and you can go crazy with the toppings. The kids will love this as well. Heat the olive oil in a large pot (I used this one) over medium heat. Stir in the shallots and sauté for 5 minutes, until translucent. Add the ground chuck, and cook until no longer pink, 8-10 minutes; drain fat. Sprinkle flour and steak seasoning over meat and stir until coated. Stir in beef broth, Worcestershire, and evaporated milk until combined. Bring mixture to a boil, stirring frequently. Reduce heat to low and simmer 30 minutes. Stir in cheese until melted. Serve warm and topped with desired garnish. Bunny Tea Set - This Week's Find! 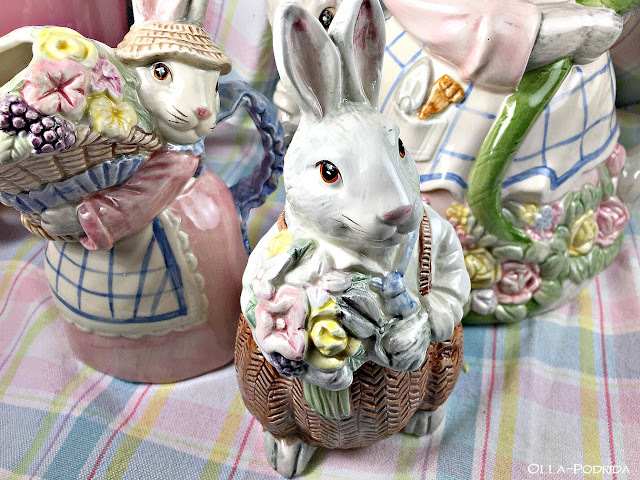 I have little by way of Easter tableware and decorations with the exception of some wonderful bunny dinner plates that I have used here. 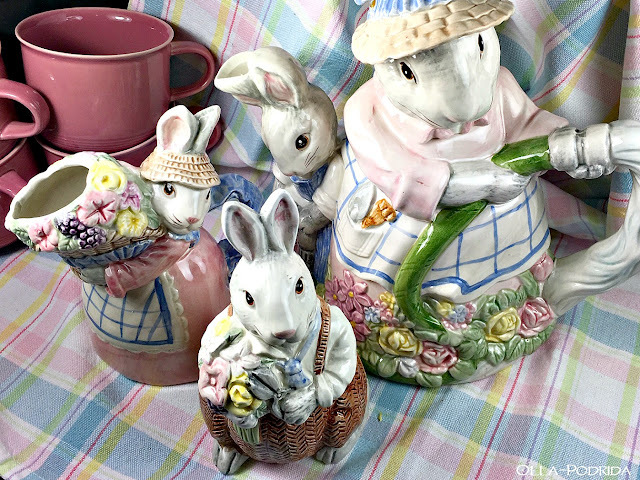 I was debating upon whether or not to bother with an Easter table considering I won’t be doing much by way of celebrating this year, when I stumbled upon this lovely Fitz & Floyd bunny tea set (from 1989) while clearing out the hutch in the breakfast room at my parents' house. My mother was like me in that she found it very difficult to resist the offerings of Fitz & Floyd. “Oh, that Fitz! Oh, that Floyd! 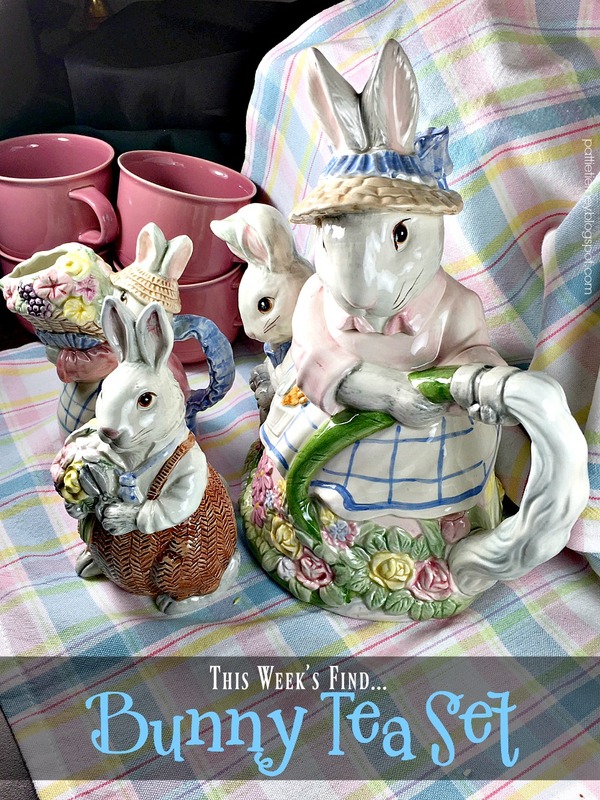 They know what we like!” we used to say as we carried our finds up to the cash register. She always hosted Easter brunch, but I don’t recall her ever serving tea, or even using the sugar and creamer when she served coffee. Now that it's in my home, I guarantee it will be put to good use, more than likely with the pink cups that I found a week or so ago. I love the detail in this set. 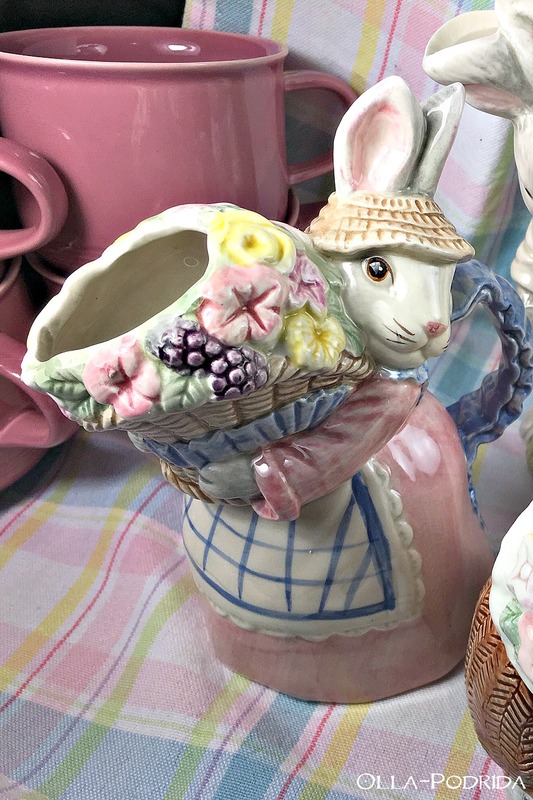 The spout on the teapot is actually a bunny. Isn’t it adorable? After giving everything a good washing, my only decision now is to decide what type of tea to brew. Come back next week to see what other treasures I have uncovered. To see my previous find, click here. It seems almost sinful that something this easy should be so good, but trust me when I tell you that it is. This luscious dessert -- that I contend would be equally good at breakfast or brunch as it is at dinner (Yes, I did have it for breakfast, if you must know.) -- simply must be added to your recipe repertoire. 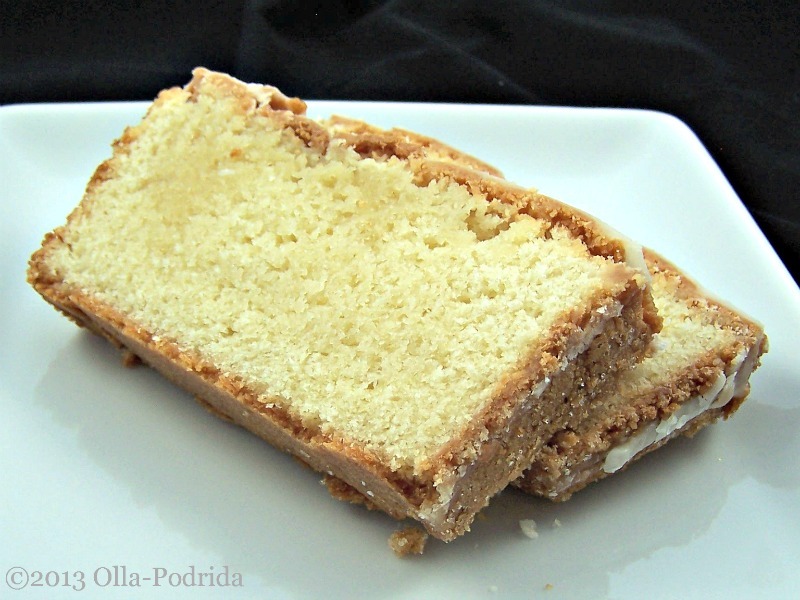 It’s like a cross between a rich almond cake and a chewy almond cookie. The grapes have a wonderful sweetness that adds an additional component to both taste and texture of this dessert to make it absolutely wonderful. The day before you plan to make this dish, cut the grapes in half and soak them in the cognac. Cover and refrigerate overnight. In the work bowl of a food processor, pulse almonds and 2 tablespoons of the sugar until finely ground. Pulse in flour and salt; set aside. Beat together butter and remaining 6 tablespoons sugar in a bowl with an electric mixer at high speed until pale and fluffy, then beat in extracts. Add eggs 1 at a time, beating well after each addition. Reduce speed to low and beat in ground almonds, flour, and salt mixture until just combined. Divide batter among 4 shallow 1/3-cup (1/2" deep) gratin dishes (I used these), and press grapes lightly into batter (discard Cognac). Bake in dishes on a baking sheet until cake is firm and pale golden with slightly darker edges, about 20 minutes. Transfer cakes to a rack and cool slightly in dishes before serving. *I used what I had on hand -- Blue Diamond Low Sodium Lightly Salted Almonds that I buy in 16-oz. bags and keep in the freezer. In this case, I did not add the additional salt. 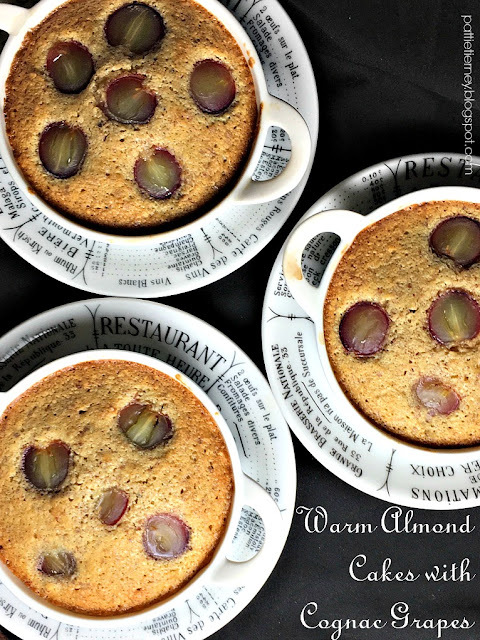 I like the speckled look the whole almonds with their skins gave this dessert. Really, you can use whatever you have, just measure it out, and grind it up. If you love almond like I do, then you will enjoy this Almond Yogurt Pound Cake. 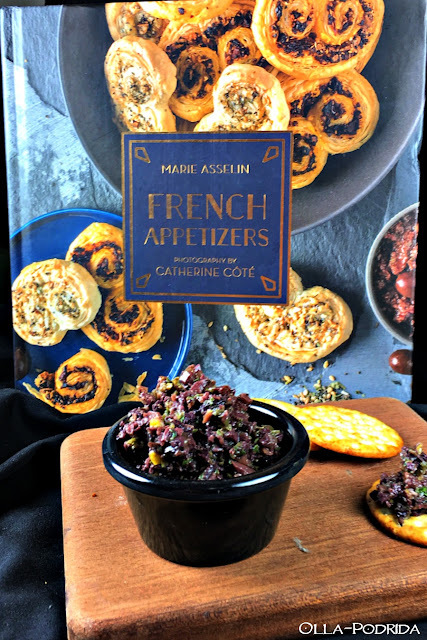 I have been having a blast cooking from a new acquisition, French Appetizers by Marie Asselin. Full of easy-to-prepare appetizers both sweet and savory, this book provides all that you need to plan a stress-free event, learning how to enjoy the cocktail hour in the French way. The book is divided into seven sections: Basics and Condiments, Small Bites, Savory Cakes and Tarts, Bread Sandwiches and Toast, Terrines, Sweet Bites, and Drinks. Everything you need to plan a party is in this book, all of it doable no matter your level of cooking skill. I have only had this book for a brief time, and it is already well thumbed. In addition to recipes for tasty cocktails, you will also learn how to make fruit and flower syrups to enhance your own beverages. Besides Simple Syrup, there are syrup recipes for Blackberry Lavender, Raspberry Rose, Lemon Chamomile, Orange Verbena, and Strawberry Hibiscus. If you’re getting the idea that this is a book that you cannot do without, you’re right. As soon as you are able, run, don’t walk to your local bookstore, or favorite book-buying Internet source, and pick up a copy for yourself; you may also consider mom for Mother’s Day. You will thoroughly enjoy both cooking and nibbling from this book. Add all the ingredients to a food processor or use a hand blender. Process or blend until finely and evenly chopped, scraping down the sides if needed. 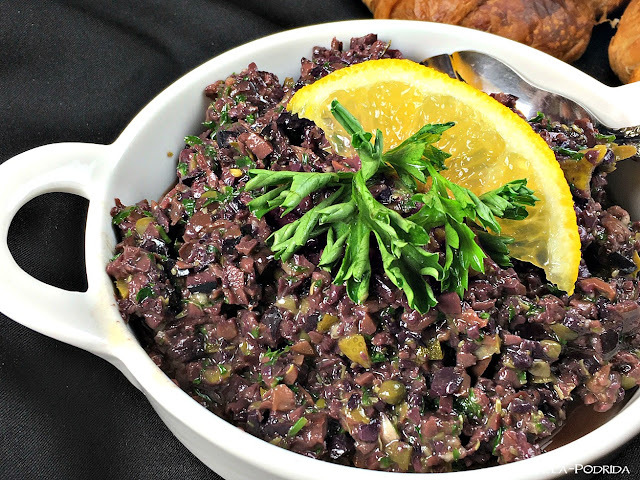 The tapenade will be quite thick and chunky. For a smoother, creamier texture, add an additional 2 tablespoons olive oil and process until desired consistency. *I used a teaspoon of anchovy paste. Another fabulous spread is Olive Cheese Spread, one of the most popular recipes on the blog! Try it! 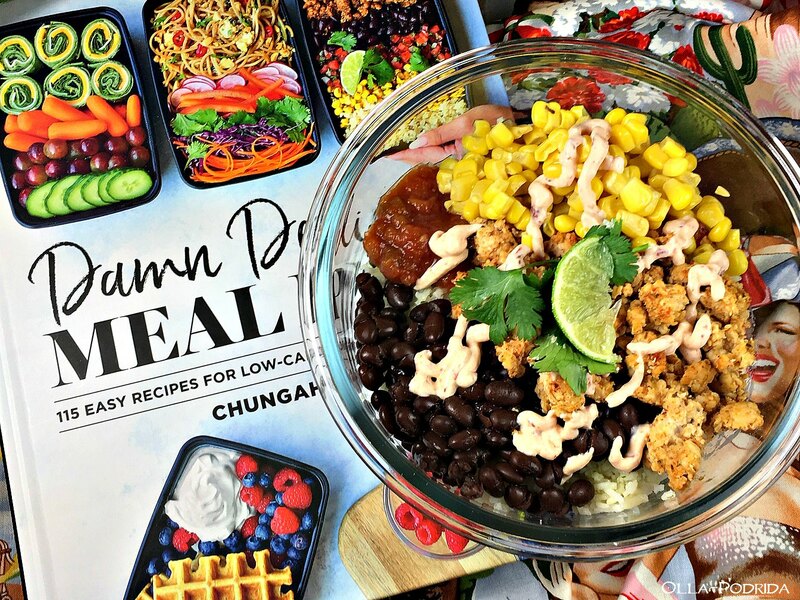 If you are familiar with Chungah Rhee’s blog Damn Delicious, then you are well aware that this woman knows her food. Her first cookbook of the same name is one of the most used on my shelf. Her latest book, Damn Delicious Meal Prep, 115 Easy Recipes for Low-Calorie, High-Energy Living is just as good. I have always liked the idea of meal prep, but never knew exactly how to get started. Oh sure, I’ve dabbled, but I didn’t have enough recipes to really go at it seriously. Now, I do. This book is the Bible of meal prep. An ample introduction will familiarize you with the process, a comprehensive shopping list will guide you as to exactly what to get, and then you will be off and running. Once you try this, it will change your life. 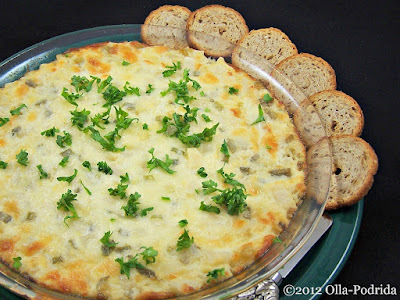 Every recipe that I have tried has been easy to prepare, satisfying, and delicious. The bonus is that meals are on hand when I want them, and good for me as well. Talk about a win, win! The recipes run the gamut from snacks to smoothies, lunches and dinners, breakfasts, and even desserts. 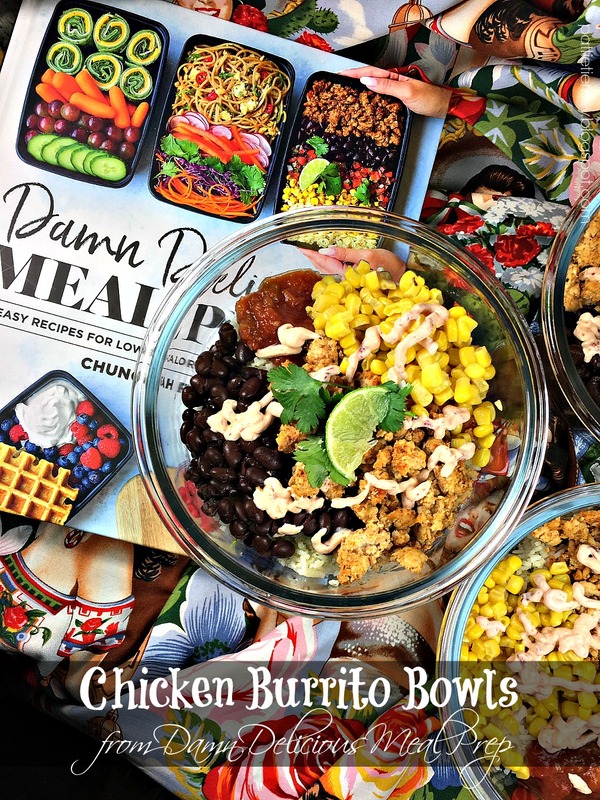 My favorites have been the Thai Basil Chicken Balls, Vegetable Potstickers, Freezer Breakfast Croissant Sandwiches, Cheesy Chicken and Broccoli Rice Casserole, and the recipe that I am sharing with you today for Chicken Burrito Bowls. So grab your prep bowls and let’s go! This was my first experience with ground chicken and it will not be my last. I couldn’t believe how good it was. There is something about the texture of the chicken, combined with the seasonings, that really makes you feel as if you are eating a decadent burrito. I replaced the plain rice for my Cilantro Lime Rice, and instead of making Pico de Gallo I used some salsa that I had in the fridge. I am so happy to have so many delicious meals this week, all of which are low in calories. 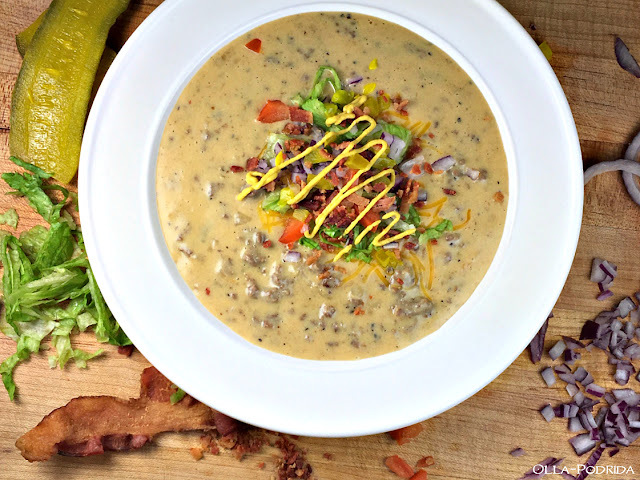 This recipe provides you with an incredibly delicious meal for a mere 488 calories. Plus it is low in fat, and high in protein. Wow! 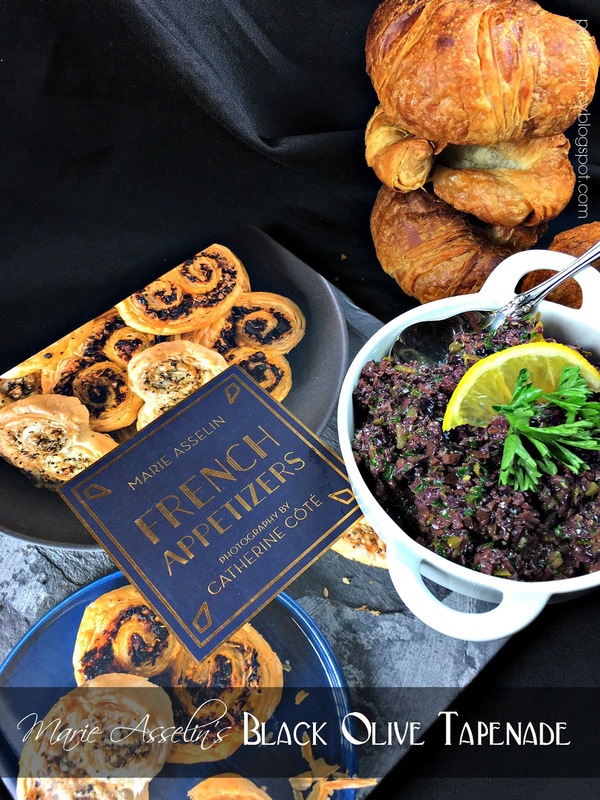 Each recipe in this book, most of which are accompanied by luscious photos, features an into by Rhee, provides prep time, cook time, total time, and number of servings, plus includes nutritional facts at the bottom. I think you will be surprised at how delicious relatively few calories can be. I cannot say enough about this wonderful book. Next I’m going to try the Mason Jar Lasagna. After that the Fried Chicken TV Dinner. The excitement never ends! I don’t think I have ever had as much fun making a week's worth of dinners as I have making these. If you don’t have this book buy it! Whisk together the yogurt, chipotle pepper, garlic, and lime juice. Cover and refrigerate for up to three days. Heat the olive oil in a large stockpot or Dutch oven over medium-high heat. Add the ground chicken, chili powder, garlic powder, cumin, oregano, onion powder, and paprika; season with salt and pepper. Cook until the chicken has browned, 3 to 5 minutes, making sure to crumble the chicken as it cooks; drain excess fat. Divide rice into four meal prep containers. 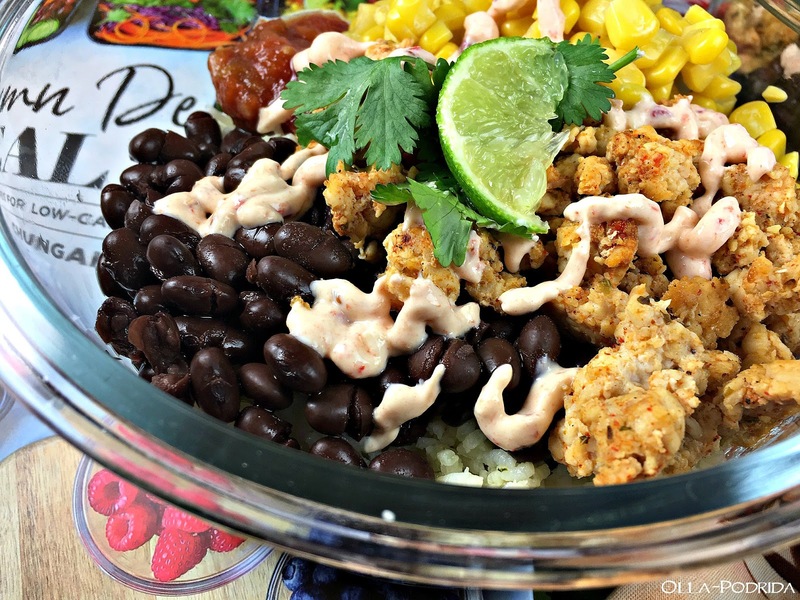 Top with ground chicken mixture, black beans, corn, and pico de gallo. It will keep covered in the refrigerator for 3 to 4 days. 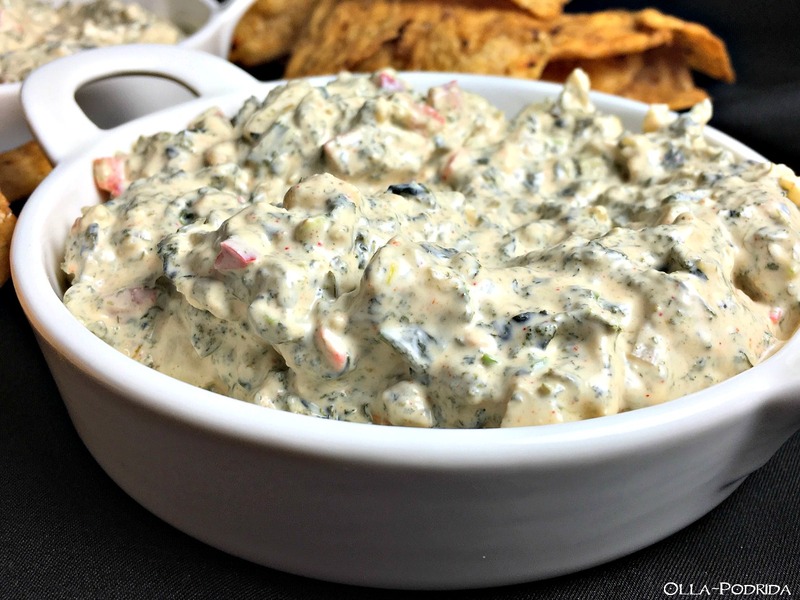 Drizzle with Chipotle Cream Sauce. 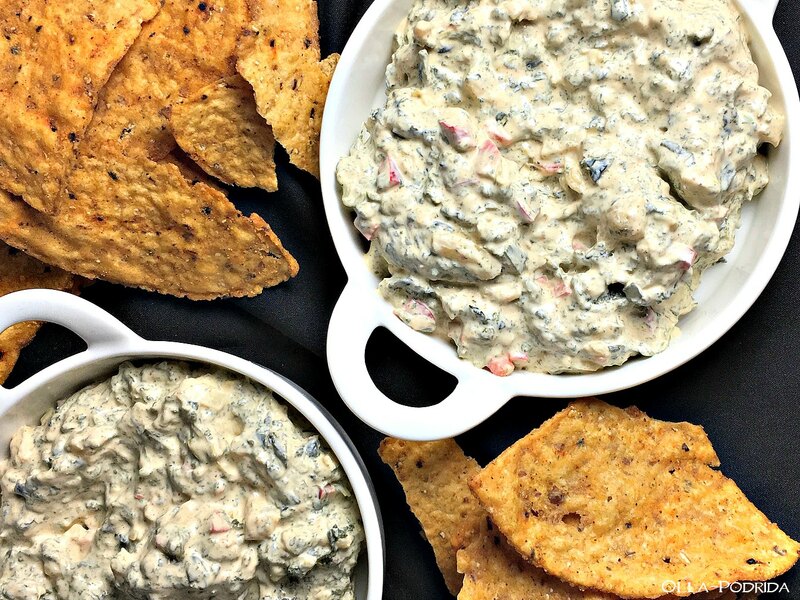 Garnish with cilantro and lime wedge, if desired, and serve. Reheat in the microwave in 30-second intervals until heated through.